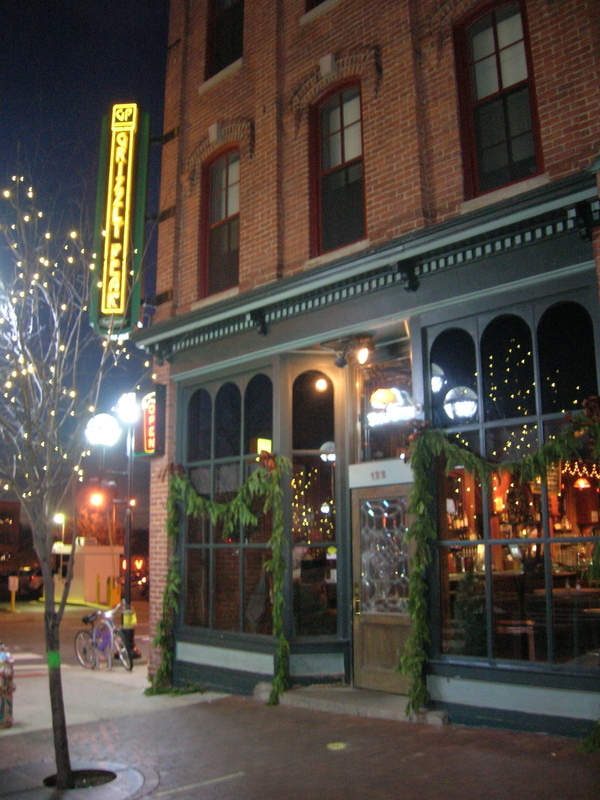 Within walking distance of University of Michigan football stadium, the spacious, arched high-ceilinged LEOPOLD BROTHERS not only brewed on-site, but also distilled gin and vodka, August ’04. The sports bar atmosphere included pool tables, several televisions, cafeteria style dining tables, and outdoor patios. Small beer selection offered decent fare such as sour fruited staple Red Lager, wheat-sugary hop-spiced Golden Lager, floral-hopped wheat-soured Pilsner, metallic banana nut-clove-allspice-induced lemon-tart Hefeweizen, and muddled nut-roasted wood-burnt orange-tart Porter (with oak-dried grape-cherry tannins). But the brewery-distillery closed by 2007. Nearly as rewarding as Arbor Brewing and one-eighth mile west, larger GRIZZLY PEAK BREWPUB offered beautiful wood-carved mantle-bar, ample dining space, summertime front deck, and diverse beer-ale selection, on initial August ’04 endeavor. Fizzy wheat-honeyed Victor’s Golden Ale; sweet fruit-spiced Pale Ale; pale-malted red-fruited Anniversary Ale Super Bitter; dry lemon-bruised clove-spiced orange-soured Hefeweizen; malt-roasted stone-fruited Steelhead Red; creamy fruit-blanched spice-tingled soft-hopped nitro-injected IPA; and mild coffee-like malt-roasted Bear Paw Porter were admirable. Cask conditioned specialties included perfume-hopped Scotch-malted rye-breaded ESB, phenol-spiced crystal-malted gin-softened Juniper Pale Ale, and nutty coffee-roasted soft-watered County Cork Irish Stout. On mid-day August ’06 visit, quaffed dry piney-hopped, yellow-orange-red-fruited, cask-conditioned serenity Williamette Pale Ale and perfumed red-fruited, dry-hopped, sharply-boozed A2 Anniversary Ale. 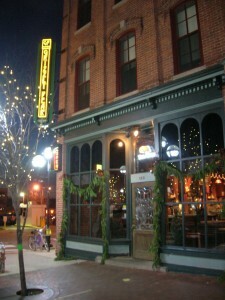 Much like nearby Detroit, this University of Michigan hotbed offered incredible brewpub selection August ‘04. Marvelous ARBOR BREWING flaunts cozy booth-laden bar area, backroom darts-jukebox section, wide ranging on-tap microbrews (Arcadia, Avery, Bell, Mendocino), terrific line of hand crafted Belgian styled ales (listed in Beer Index), and multiple diversified on-site brews by Doug Jukubiak. Lighter fare included soapy wheat-husked yellow-fruited pale ale Big Ben House Mild (for amateurs); dryly bitter-hopped Huxell Best Bitter Pale Ale; fizzy Band-Aid-nosed salami-like Smoked Lager; bright clove-banana-soured Bavarian Bliss Hefeweizen; Cascade-hopped herbal tea-blared Red Snapper Special Bitter; and tangy dark-fruited Triple Stone ESB. Darker fare included smoky tobacco-stained hop-charred Olde Number 22 German Alt; tartly citrus-soured off-dry Sacred Cow Cask Conditioned IPA; frothy hop-charred chocolate-dried coffee-roasted Milestone Cask Porter; and dry mocha-roasted Faricy Fest Irish Stout (with its ample coffee-embittered cocoa-beaned tobacco canvas). On August ’06 afternoon trip, sampled creamy dark chocolate-fronted, brown-sugared, espresso-dried, anise-dabbed, plum wined Russian Imperial Stout.